Almost every record that Carol Deene made now seems to be a cover version. This isn't really true, but she certainly took her fair share from other singers- no less than three were covers of American singer Sue Thompson, but she also covered Linda Scott and Joanie Sommers as well as fellow UK artist Valerie Mountain. Her later releases were all originals, but by then the hits had stopped; so perhaps the cover formula was a winning one. Arguably, Carol's covers were every bit as good as the originals- if not better. In my opinion, Carol's version of "Some People" was, indeed, superior to the original which was taken from the sound track of the moving picture of the same name. Most people who are old enough will remember her rendition of Norman- "Norman, Ooohoohoohoo!". It's absolutely for sure that anybody called Norman will recall it because doubtless they would have had it sung for their benefit at the time. So despite the fact that Carol had pinched the song from Sue Thompson and that BBC TV's "Juke Box Jury" gave it a resounding "raspberry", Carol made it her own- very much stamping it with her personality. In fact the lowly chart placing that Carol achieved with "Norman' probably does not properly reflect its popularity as it received a lot of airplay and was picked up vocally by almost anybody that had a Norman in earshot who they could victimise! 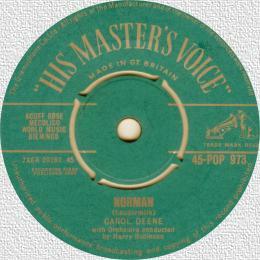 Sue Thompson's version of the song sank almost without trace in the UK but she did scrape consolation from minor chart entries with "Sad Movies" and "Paper Tiger"- the latter of which appears to have escaped Miss Deene's notice. It looked as if Carol might have a lengthy show business career and she secured herself a programme slot on Radio Luxembourg where she brought her bubbly personality to a spot of DJing alongside other stalwarts of the "Station Of The Stars" like Barry Alldis and Jimmy Saville. Sadly, Carol's show business aspirations came to an abrupt halt during 1966 when she was involved in a serious motor accident. She eventually recovered from this and began regularly touring the northern clubs, but suffered in yet a second car crash in 1974. Despite this set back she began recording again in 1979, however the resulting discs did not receive much promotion and she eventually dropped out of foreground 'pop'. Perhaps, one day we'll once again hear "Norman, Ooohoohoohoo!" sung by Carol on the 1960s nostalgia circuit, but there's little sign of that happening. Nevertheless, at the time of writing, Carol is still involved in the entertainment business and presumably putting her Luxembourg experience to good use, because she has forgone her beloved Yorkshire for the warmth of Spain where she manages a radio station with her husband.